I love photographing events, whether it is weddings, birthdays, family gatherings or christenings. I strive to capture the emotion of the day in a set of beautiful, timeless and candid photographs which you and your family can look back on in years to come. 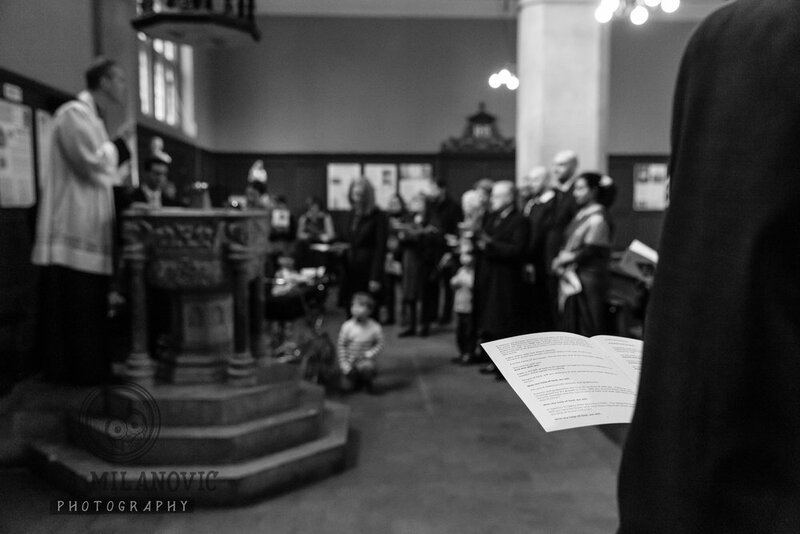 I photographed little B’s christening service a couple of months ago at St Michael and All Angels church in Chiswick. It was a beautiful service, with family and friends singing together with the minister, and children gathering around little B’s pushchair. It felt very personal, and very intimate. Following the service, family and friends gathered for some drinks, food and cake. I worked using documentary-style photography to capture the afternoon unfold, and combined wide angle shots to give the service a sense of scale and place, together with tighter framing to show detail and emotion. As Surrey christening photographer, I work across Surrey, West Sussex and London to photograph baptism or christening services. If you are planning your child’s christening or baptism, and you are considering hiring a professional photographer, please get in touch to discuss your ideas and options. I would love to hear from you!